Absolutely love this. Very groovy and feels quite laidback. 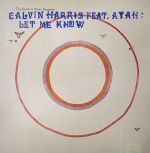 Definitely in my top ten favourite Calvin Harris songs and one of my favourites from Ayah Marar. Amazing. Would love to see something similar to this made by Calvin in future.